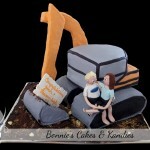 The occasion for today’s cake is a very happy one and I hope you will love this cake as much as I do! My beautiful niece, Timara, and her fiance, Kane celebrated their engagement last weekend. 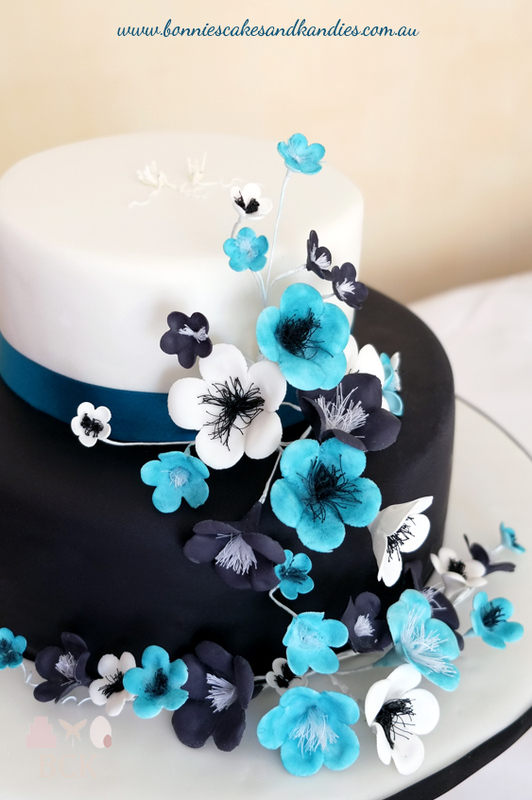 With elegant black and white tiers brought to life by eye-catching pops of blue blossoms, this cake was an absolute pleasure to make! 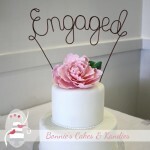 Black, white & blue, two tier engagement cake with icing flowers | Bonnie’s Cakes & Kandies, Gympie. 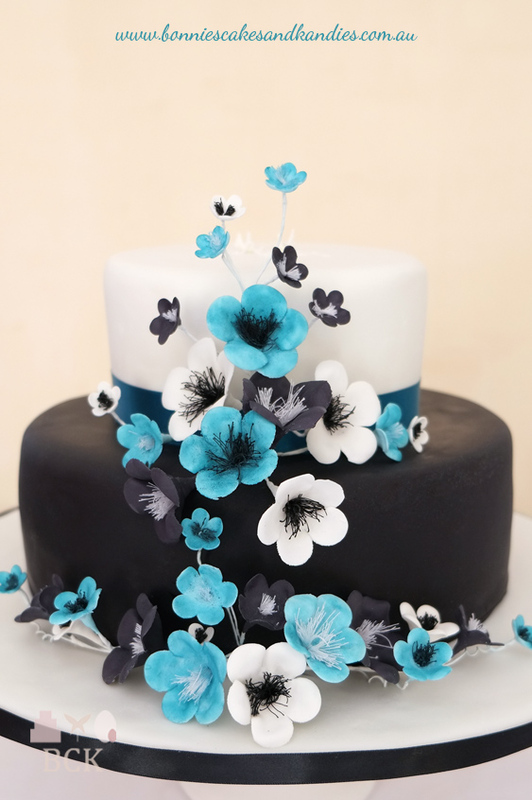 Just over 30 black, white and blue flower paste blossoms decorated Timara & Kane’s black and white engagement cake. Guests were able to choose between white chocolate or dark chocolate mud cake, with these flavours making up the top and bottom tiers respectively. 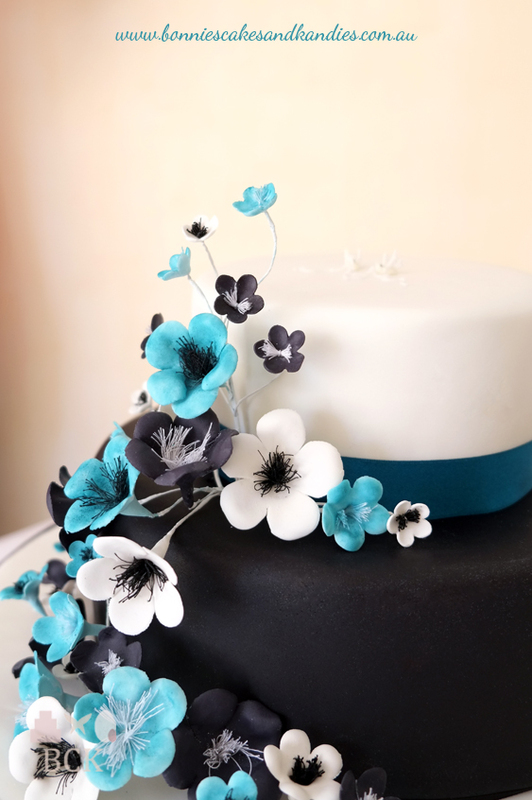 Black, white & blue icing or flower paste blossoms decorated the front of Timara & Kane’s engagement cake | Bonnie’s Cakes & Kandies, Gympie. 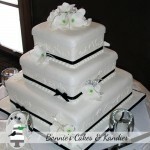 Timara & Kane’s black and white engagement cake was brought to life with pops of blue | Bonnie’s Cakes & Kandies, Gympie. 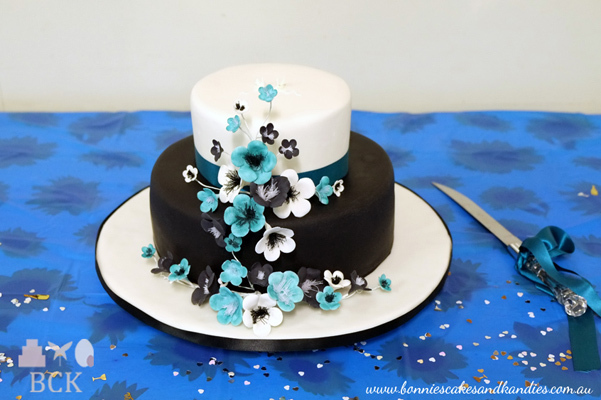 Timara’s & Kane’s black and white engagement cake with black, white & blue flower paste blossoms | Bonnie’s Cakes & Kandies, Gympie. 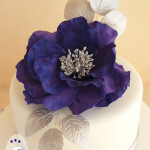 Congratulations and best wishes, Timara & Kane…may all your dreams come true!